a long time, no write… but plenty of craft! So, I have been very quiet, spending much of my time volunteering at the Melbourne Writers’ Festival and working at the fabulous Wool Baa. mmm. I love my job! I managed another ‘saturday evening’ project this weekend, crocheting for myself Gem from Kim Hargreaves ‘Heartfelt’. I’d ordered some kidsilk night from the fabulous folks at cucumperpatch and it arrived on Friday, so I bought the kid classic to match up with it and off i went! Here is the result and I wore it all day today! It’s VERY warm. 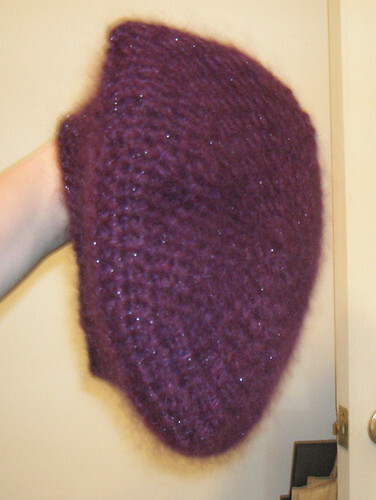 The beads on the brim are just little pale purple seed beads. My friend said the kidsilk night made it sparkle like it had been rained on or it was dewy, which is just the right amount of sparkle XD. I’ve now also done Calm from this collection, in Jo Sharp’s mohair, but I’m yet to take good photos of it. I must say that while I LOVE kim, i find i need to add more in the sleeves. I did this with calm and even then it still pulls up a bit short, so I’m tempted to knit some little ruffly cuffs in kid silk haze to wear underneath to add length – would also be useful under my cherish. Speaking of which it is now Spring! which means it should be just right to wear Cherish soon – the problem with it is it’s too warm to wear inside, but it’s still too cold outside in Melb to wear the bolero without a coat – and the big wool is just too thick to wear a coat over! so it needs to be cool enough to wear outside, but warm enough to not need another layer – hello spring! I do love it though and want to wear it more!! my current WIP is a jo nathan design from her Merino Deluxe DK book, though I’m working on it in Zara. mmmm Zara. photos to come… I’m also working on a beautiful baby alpaca scarf which I have a feeling i will wear CONSTANTLY when it’s finished! I am really excited about the next one and I must say I picked up a lot of business tips and ideas too, which is great. Speaking of etsy there are now some ‘manly’ things on there, something I’m working on. There’s a gorgeous black and tan scarf and a reversable rib beanie. I’m also trying to make a bit of a niche for myself with knitted flower accessories, like hair clips and brooches. I’ve been getting a lot done, but I still feel like there are things I need to finish – primarily because i either have everything i need, or i’ve actually started them. Mainly this is sewn items – including the dress I’ve actually cut out and need to put together. I cut it out in May… lol. Anyway I will leave you with two things. 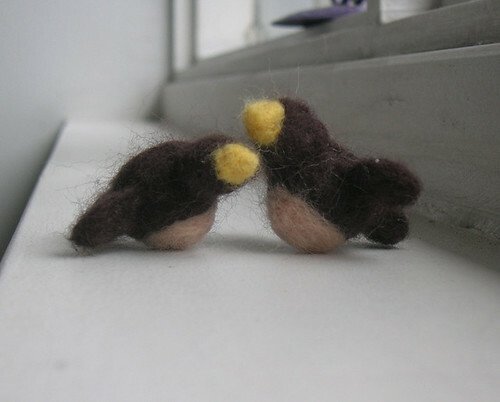 The first are some little felted birdies that need a purpose… ideas are welcome. 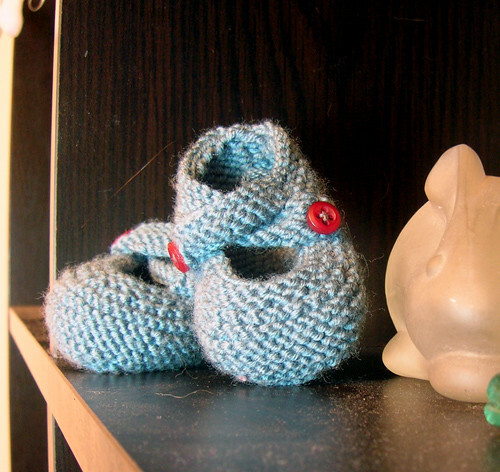 The second is a link to the most hilariously awesome thing i have ever seen on etsy made by fellow melbournian jellibat.